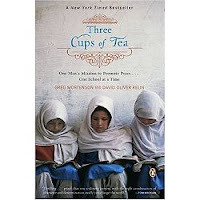 I have very mixed reactions to the New York Times Bestseller Three Cups of Tea by Greg Mortenson and David Oliver Relin. 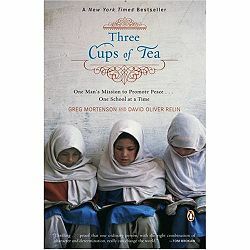 On the one hand, it is a very inspiring story about how Greg Mortenson has dedicated his life to building schools in Pakistan (and now in Afghanistan). Mortenson was a mountaineer who stumbled into a remote Pakistan village after a failed attempt to climb K2, the second highest mountain on Earth. The villagers helped Mortenson regain his health and in return he promised to return and build a school for the children there. The book chronicles his three year venture to build a school in that first village and then in many villages in Pakistan. His philosophy revolves around educating children (especially girls) in order to alleviate poverty and improve their lives. One chapter of the book explains how many new schools are being built which offer a skewed education, inciting youth to join terrorist organizations. The schools Mortenson (and the agency he co-founded, the Central Asia Institute) are building offer a much-needed alternative. There were many disappointing aspects to the book, however. The book is written by David Oliver Relin as the story was told to him by Greg Mortenson (and others that he interviewed). The impression I got from the book was that Mortenson could do no wrong, everything he does is great and is done with the right motives, and he has single-handily changed education in Pakistan. Obviously what Mortenson has and is doing is a wonderful accomplishment, but the biased view presented in the book was overdone. Also, as the book covers many years (Mortenson's failed K2 attempt was in 1993 and the book was published in 2006), many world events, including 9/11, brought changes in our country as well as Pakistan and Afghanistan. The book portrays America as the "bad" country with a president making promises but not keeping them . . . all the while, of course, portraying that Mortenson is that one American who was making a difference. I know there's a lot of controversy over the actions taken by the US and the war on terrorism, but the book continually criticized America. I'm actually amazed that Mortenson still returns here when his true love is the people of Pakistan. He does have a wife and two children in Montana, and while the book talks about his wife's support of his passion to build schools, I couldn't help but feel that they get the leftover part of his life. And, unfortunately, God seems to be absent from Mortenson's life. There is much discussion about how the various cultures in Pakistan pray (proper posture, ritual washing, facing Mecca, etc) and how Mortenson learns and performs these rituals in order to earn the respect of those he wants to help, however there is no discussion of Mortenson's personal beliefs. Would I recommend this book? That's a tough question to answer. I guess it would depend on who was asking. I would say yes to someone who wants to read an inspiring story about how one person can make a difference in the lives of others and/or wants to learn more about the culture and life in Pakistan and Afghanistan. I would no to someone who is easily swayed to believe that because something is in print it must be an important truth or who is likely to accept the criticisms offered in the book without further research. Thanks for your comment on my blog about the summer beach picture. I am sitting in the chair and my sister in-law is on the beach blanket. Can't wait to be there again (NC) this summer!